Every pickup truck commercial has the brand trying to convince us that its model is the biggest, brawniest vehicle on the block. But Ford and Ram appear ready to really throw down the gauntlet and scrap over the towing figures for their heavy-duty models, and it could potentially end up in court. The issue revolves around what it means to be best in class. Ford claims that its 2015 F-450 (pictured above) has a maxtow rating of 31,200 pounds, compared to 30,000 pounds for the Ram 3500 (right). However, both companies market these heavy haulers as having the top towing in their class. According to Automotive News, Ford is threatening legal action if Ram doesn't back down. The situation isn't as simple as just comparing the numbers, though. First, the two companies calculate their towing capacities differently. Ram adheres to the SAE J2807 rating, while Ford uses its own internal system. Although, as the company introduces new models, they are certified using the SAE standard. "When an all-new F-Series Super Duty is introduced, it also will use SAE J2807," said Ford to Autoblog in an emailed statement. The second issue hinges on whether the F-450 and Ram 3500 are even in the same class at all. The "best-in-class" boast hinges on both trucks belonging to the Department of Transportation's Class 3 rules, stipulating that above a gross vehicle weight rating of 14,000 pounds, a model moves into Class 4. Ford claims that the F-450 has a GVWR of exactly that amount. However, according to Automotive News, the company removes the spare tire, tire jack and center console to reach that number. Ford is sticking to its guns, though. 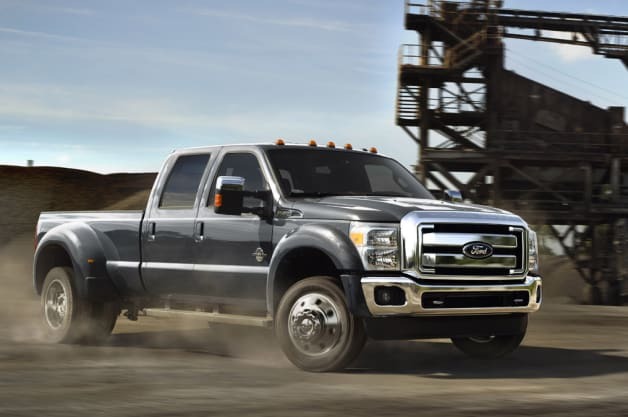 "The 2015 F-450 pickup is a Class 3 (10,001 lbs. – 14,000 lbs. GVWR) dual rear-wheel, chassis-certified pickup truck," said the company in a statement emailed to Autoblog. Although, Ram isn't changing course either. "Our best-in-class claim of 30,000 pounds of towing capacity for the 2014 Ram 3500 stands firm in the 350/3500 segment. Additionally, unlike our competitors, our new 2015 Ram 3500 will hold the title and weight capacity while adhering to the SAE J2807 towing test criteria," said Ram in a statement emailed to Autoblog.